Recognising the generic nature of many on-farm biosecurity practices and the prevalence of mixed farming in Australia, Plant Health Australia (PHA) manages the Farm Biosecurity awareness campaign jointly with Animal Health Australia (AHA). The goal is to help producers reduce the risks posed by diseases, pests and weeds to crops and livestock. The Farm Biosecurity website provides information about on-farm biosecurity measures, which help prevent emergency animal disease outbreaks and exotic plant pest incursions. It encourages producers to identify risks to their livestock, crops and plant products, and to minimise those risks through good practices. The site also provides extensive information for growers of pollination reliant crops, such as fruit and nut, vegetable and grain growers. personal profiler to collect industry specific information from the site. 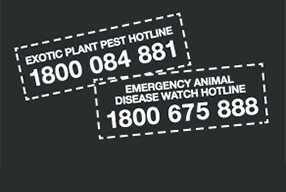 Producers are encouraged to check their properties regularly and, if they see anything unusual, to call the Emergency Animal Disease Watch Hotline on 1800 675 888 or the Exotic Plant Pest Hotline on 1800 084 881. Animal Health Australia (AHA) is an innovative partnership involving the Australian Government, state and territory governments, major livestock industries and other stakeholders. AHA works with members and stakeholders to strengthen Australia’s national animal health system and to maximise confidence in the safety and quality of Australia’s livestock products in domestic and overseas markets. Plant Health Australia (PHA) is the national coordinator of the government-industry partnership for plant biosecurity in Australia. As a not-for-profit company, it serves the needs of members and is an independent advocate of the national plant biosecurity system.